Dr Samuel Johnson by Sir Joshua Reynolds has now returned on display in Room 12 after a substantial period in conservation. This has revealed some fascinating insights into how the portrait was painted and its complex history. It was left unfinished by Reynolds but there have been several changes to the portrait since its initial composition. A symposium to discuss the issues arising from the painting’s history and conservation took place at the National Portrait Gallery in June 2008 - read the synopsis of the papers given from this link. 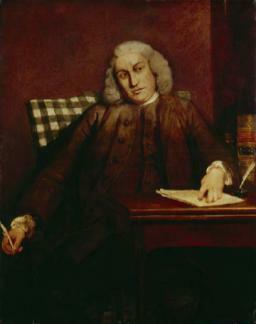 Reynolds began painting the portrait around 1756 just after Johnson published his famous Dictionary of the English Language in 1755. It was not a commission and Reynolds may have begun it as a personal tribute to his great friend. The date of 1756 appeared on the subsequent engraving of the painting but, as there is no sitter book for Reynolds in 1756, it cannot be definitively stated when the painting was created. The sitter book for 1757 does have appointments for “Mr Johnson” on 25 January, 3 & 10 February and 30 April which may have been appointments for sittings but it is not possible to be sure. The 1750s were a period of experimentation for Reynolds in terms of his painting materials and technique. Research by Martin Postle as described in his paper ‘Reynolds in the 1750s: technical matters’ at the National Portrait Gallery symposium shows that Reynolds was very influenced by his time in Italy studying the Old Masters. On his return he wished to emulate the brilliant colour and thickly painted work of these pictures and began to experiment intensively to replicate this effect. 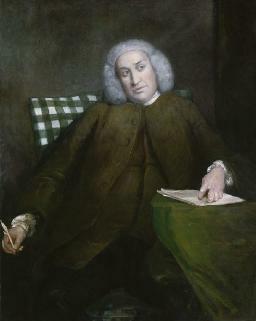 Dr Samuel Johnson was one such portrait in which evidence of such experimentation with pigments can be observed. There is also a suggestion from the type of brushwork used in the painting that it was painted speedily. 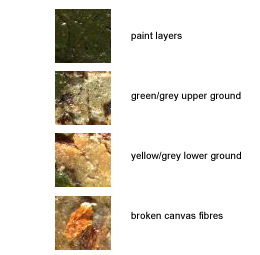 The variety of pigments used and the different layers of paint can be seen in a cross section of the painting, extracted from the section of the green cloth on the table. The painting remained unfinished in Reynolds’s studio until 1789 when it was given by the artist to Johnson’s friend and biographer, James Boswell. 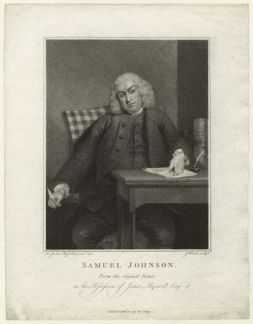 He was then writing his Life of Samuel Johnson, published 16 May 1791. He had stated in the manuscript for this book that the painting was “unfinished, though I cannot help thinking it a striking likeness” (Ingamells, p. 287). Boswell was keen to have Reynolds’s unknown portrait engraved as a frontispiece. The portrait was therefore transferred from Reynolds’s studio to Boswell who arranged for the engraver James Heath to prepare an engraving as a frontispiece. This is documented in a report in The Public Advertiser 24 March 1789 which states that the portrait was due to be delivered to the engraver James Heath but ‘most happily was delayed’ thus avoiding a fire on the engraver’s premises on 20 March. The Public Advertiser wrote on 18 June 1791 that ‘Sir Joshua Reynolds with a munificence truly princely has…presented Mr Boswell with the large portrait of Dr Johnson’. ‘This is the first impression of the plate after Mr Heath the engraver thought it was finished. He went with me to Sir Joshua Reynolds who suggested that the countenance was too young and not thoughtful enough. Mr Heath therefore altered it so much to its advantage that Sir Joshua was quite satisfied and Heath then saw such a difference that he said he would not for a hundred pounds have had it remain as it was’. In the third state Johnson’s gaze is shown marginally changed towards the spectator, shadows have appeared around the eyes and a frown on the forehead. The chair arm is shown below the right wrist. 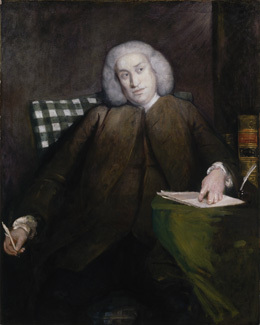 Boswell wrote another inscription on this third state, which is now at Harvard University: ‘Second impression of Dr Johnson’s portrait after the Plate had been improved by Sir Joshua Reynolds’s suggestions. Mr Heath afterwards gave it a few additional touches’. The fourth and final state is virtually the same as the third state but has slight additional touches on the coat and breeches. This is how the print appeared when it was published in 1791 as the frontispiece to Boswell’s The Life of Samuel Johnson. By virtue of the sequence of proofs the changes to Johnson’s features can be followed so that he appeared older and conveyed more gravitas as befitting the image of a venerated older man of learning and compiler of the Dictionary. Details of his coat and wig were also changed but the principal difference from the original composition related to the addition of books, an inkwell with second quill and a wooden card table. It can be demonstrated from Boswell’s inscriptions on the second and third states of the engraving that Reynolds appears to have been involved in the supervision of the production of the engraving. As Boswell claimed in his inscriptions, Reynolds was ‘quite satisfied’ with alterations in the engraving intended to transform a portrait of a young Johnson into an image of an older celebrated literary figure. 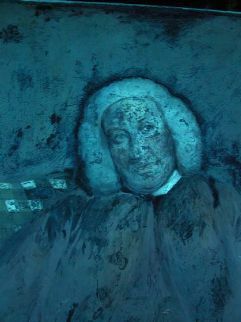 Recent conservation has revealed that the painted portrait of Dr Samuel Johnson also underwent a number of changes which are linked to the alterations made to the engraving. 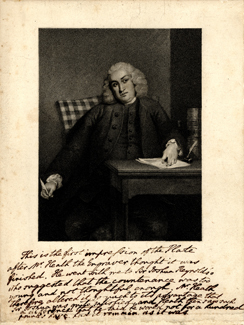 Technical analysis indicates that several elements including books, an inkwell and a second quill on the table were subsequent additions to the portrait. It is not clear whether they were added in Reynolds’s studio or by a separate artist but their presence in the engraving in 1791 suggests they were identified with the portrait by this time. In the cross-section shown above, for example, it is clear that the green draped table was present in the painting before the subsequent overlayer of pigments used to create the wooden card table. Due to his experimental use of paint, during the early nineteenth century the painting of Johnson began to fade, as is typical of Reynolds’s work. In 1825, in the same year that it was sold on Boswell’s death, it was described as ‘completely faded’ by Lady Boswell. In 1867, the complexion was described as ‘quite pale’ and the whole was not considered worthy of Reynolds by a representative of the National Portrait Gallery who had inspected the work. In 1884, the portrait was described as having been ‘painted on’ when it was exhibited at the Grosvenor House Gallery (Ingamells, p. 288). This phrase probably refers to heavy restorations that the work had undergone during preceding decades in an attempt to improve the decayed surface and troubled appearance of a portrait of such an important national figure. It was in such a condition that the work was given anonymously to the National Portrait Gallery in 1911. 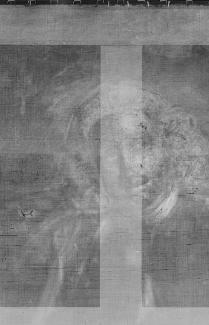 In 1976 the portrait underwent significant restoration treatment in order to consolidate its condition and appearance. As shown in the first image above, in its pre-1976 condition, the painting had become very dark, particularly in the background, and this was felt to be detrimental to the appearance of the work. Various conclusions were drawn at the time of this conservation which related to the chronology of the additions to Reynolds’s work and the extent of nineteenth-century restorations. But at this time, in 1976, the existence of the inscriptions on the second and third proof engravings was not widely known. On the basis that aspects of the composition, as itemised above, were later additions to the painting and did not appear to be by Reynolds’s own hand and, using the technical and research tools available at the time, it was decided to proceed with a treatment which would alter alter the appearance of the work. In this respect discoloured varnish was removed together with considerable brown overpaint on the background and jacket, the retouchings on the face and the wooden card table. The books, inkwell and second quill were covered over (with an easily soluble paint) and the table with the green tablecloth was revealed. New varnish was applied and the cool green-grey colours were restored. The painting then looked like this until 2007. 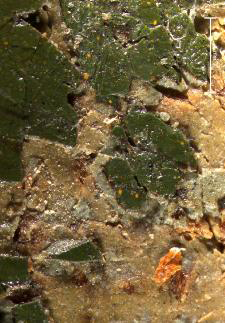 Extensive conservation work was required following damage to the painting by a member of the public in 2007. The latest treatment comprised structural consolidations and relining to ensure the stability of the canvas. It also involved a decision to reveal the books, second quill and inkwell based on the latest academic and technical findings. The factors described above have made this painting extremely difficult to conserve but have led us to believe that insomuch as it is known that the additions to the 1756 composition were approved of by Reynolds they should, as far as is now possible, appear part of the portrait. The images shown below illustrate some of the different types of examination which were used to help in the recent conservation treatment and to assist our understanding of the painting’s history.